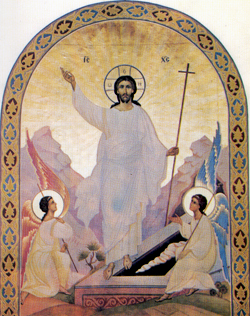 Pascha is the essence of our faith: for Christ rose from the dead, and we will rise from the dead. Therefore, Pascha is the Feast of feasts and the Triumph of triumphs, and the services of this feast are exceptionally magnificent and exceptionally triumphant. On Friday at the ninth hour (by contemporary calculation at about three in the afternoon) Christ, Who was crucified on the cross, gave up His spirit to God the Father. Only His young disciple John, the Mother of God, and several other women stood by the Cross, weeping over Christ’s suffering, – all the others had much earlier run away in fear. After Christ’s death, “when it was evening, a rich man from Arimathea arrived; his name was Joseph, and he was also a disciple of Jesus. He went into the presence of Pilate and asked for the body of Jesus. Pilate gave orders for the body to be given to Joseph. So Joseph took it, wrapped it in a new linen sheet, and placed it in his own grave, which he had just recently dug out of the rock. Then he rolled a large stone across the entrance to the grave and went away. On the next day – that is, the day following Friday, – the chief priests and the Pharisees met with Pilate and said: ‘Sir, we remember that while that liar was still alive, He said “I will be raised to life after three days.” Give orders, then, for the grave to be safely guarded until the third day, so that His disciples will not be able to go and steal Him, and then tell the people “He was raised from death.” This last lie would be even worse than the first one.’ ‘Take a guard,’ Pilate told them; ‘go and guard the grave as best you can.’ So they left, and made the grave secure by putting a seal on the stone and leaving the guard to watch” (Matt. 27:57-66). After midnight from Saturday to the next day after it (now known as Sunday), the greatest and most joyous event in the whole world occurred: the guard was standing at the grave, the large stone with the seal was intact; suddenly the earth shook and our Lord Jesus Christ by the power of His Divinity arose from the dead and left the tomb. Soon after this an angel came down from Heaven and rolled away the stone from the entrance to the tomb and sat upon it. His appearance was like lightning and his clothes were white as snow. The soldiers guarding the grave fell to the ground in terror, but then got up and ran to tell the chief priests of what had occurred. The chief priests gave the guards a large sum of money and said: “You are to say that His disciples came during the night and stole His body while you were asleep. And if the Governor should hear of this, we will convince him, and you will have nothing to worry about.” The guards took the money and did what they were told to do. And to this very day that is the report spread around by the Jews. (Matt. 28:13-15). Meanwhile, in the early morning, while it was still dark, several pious women were hurrying to the Lord’s tomb to anoint the body of Christ with aromatic myrrh. They were not aware of the great event that had taken place, nor even of the seal of the Sanhedrin or of the guards. Their worry was only about who would roll away the heavy stone from the grave. Mary Magdalene, being ahead of the rest, reached the grave first, and seeing that the stone was rolled away, ran to Peter and John saying: “They have taken the Lord from the tomb and we do not know where they have put Him.” Hearing this, Peter and John immediately ran to the grave with Mary Magdalene. The rest of the myrrh-bearing women came to the grave and saw that the stone had been rolled away. So they went in, but they did not find the body of the Lord Jesus. They stood there uncertain about this, when suddenly two men in bright shining clothes appeared before them. Full of fear, the women bowed down to the ground, as the men said to them: “Why are you looking among the dead for One Who is alive? He is not here; He has risen. Remember what He said to you while He was in Galilee: The Son of man must be handed over to sinful men, be nailed to the cross, and be raised to life on the third day.” Then the women remembered his words, returned from the grave, and told all these things to the eleven disciples and the rest. (Luke 24:3-9).